I'm sitting at my desk slowly recovering from jet lag after landing from Chicago at 7am this morning. What was I doing in Chicago? Learning all the stuff that happens after you put down the camera, that's what. Chase Jarvis, Seattle-based commercial photographer and all-round good guy, had sponsored me to attend the Strictly Business 2 seminar given by ASMP - American Society of Media Photographers, the US equivalent of our own AoP. I think I learned more about the business of photography in the 3 days of seminars and 1-2-1 consultations than I have in 2 years of reading books. The covered ranged from marketing and self-promotion, to preparing estimates, pricing, negotiation and managing clients. More about it all over the next few days, so stay tuned! N.B. 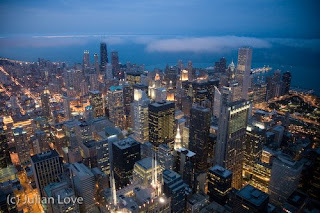 - the photo above is from the observation deck of the Sears Tower, taken in July 2006. On this recent visit it was raining and only just above freezing. Nice.